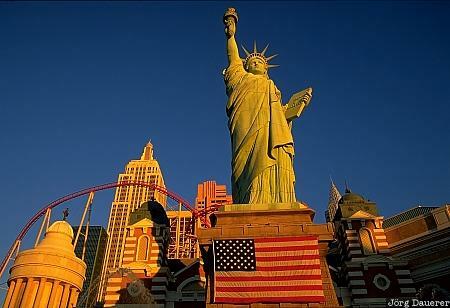 The Statue of Liberty in front of the New York-New York Casino in Las Vegas illuminated by the first light of the day. Las Vegas is in southern Nevada, United States. This photo was taken in the morning of a hot day in October of 2002. This photo was taken with a digital camera.